Everything tastes better when it’s made local, especially beer! From ales that will become your next favorite, to heavier stouts that will surely give you a relaxing evening, Alabama’s excellent breweries are serving it all. 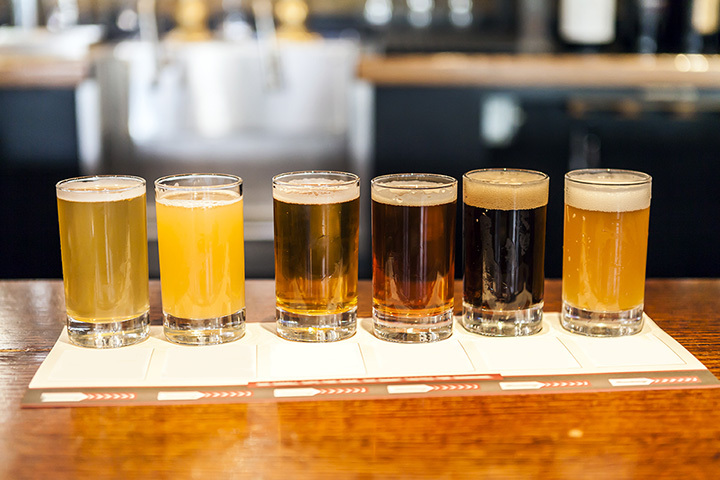 Visit these Alabama breweries for good people and tasty brews. At Druid City, each beer has its own special character. Although the small-but-mighty brewery are known best for their quality pale ale, Druid City Brewing is also one of the most creative breweries in Alabama, regularly coming out with new and innovative brews by the season. To enjoy their tasty beers, visit their tap room in Tuscaloosa. Their chalkboard always has a fun drawing celebrating the Crimson Tide or playfully taunting rival SEC teams. On a hot summer day, there’s nothing better than sitting outside in Avondale’s beer garden and sipping on one of their craft brews. From their famous Miss Fancy Tripel to their refreshing Peach Saison, Avondale has something for every type of beer fan. For beer drinkers preferring a richer brew, try their Vanillaphant Porter; you will not be disappointed. For inspired brews with a coastal flair, check out Fairhope Brewing Company. Featuring a number of year-round brews, they also host a large selection of “Occasionals” and Small Batch brews to pique your interest. A stand-out among their offerings is their I Think, Therefore I Amber. Across the way from the Birmingham Barons’ field sits the lively Good People Brewing taproom, chalk full of all their best seasonal and regular brews. Don’t miss out on their Snake Handler IPA, a coalition of tasty hops that will keep you wanting more. Folklore Brewing is a friendly, family-owned brewery with many stories to tell. A quaint brewery with tasty brews, they typically house nothing short of ten quality brews on tap. The Grateful Red stands out among their selection of inspired beers. As one of the most celebrated breweries in Alabama, Back Forty Beer Company boasts a strong selection of brews. Their Naked Pig Pale Ale and Truck Stop Honey are two of their most successful brews, while their Trade Day Cuban Stout remains a local favorite. Tucked away in Madison, the Old Black Bear Brewery is a hidden gem of Alabama. They boast a solid selection of classic brews, such as their Rockledge IPA and Cave City Lager. Not to mention, their OktoBearfest is one of the best Munich-style brews in the South. Trim Tab Brewing is a company built on the idea of community. Stemmed from the belief that beer can bring people together, Trim Tab has been doing just that for years with their collection of delicious brews. Their flagship TrimTab IPA is top notch, and their many seasonals will keep you wanting more. Come aboard the “magic bus” of brewing and try a beer or two at Green Bus. The small brewery makes a number of tasty, creative brews, including the delightful Tiramisu Milk Stout. Stop by their taproom in Huntsville for an original-tasting beer. Cahaba puts the passion in brewing. Founded in 2011 by a small coalition of beer lovers, the company has made its mark on Alabama brewing with its inventive takes on different styles of beer. Their American Blonde is one of the best blondes in the South, and their Kiwi Kolsch is a seasonal you cannot miss. View more Alabama Breweries and Brew Pubs.